This blog examines the importance of efficient stock control. It’s crucial as it means your business will have the right amount of stock, in the right place, at the right time. If you hold too much stock, or order too soon, then you are tying up cash and you may be incurring storage costs. Goods could deteriorate, or be subject to theft, damage, or become obsolete. Hold too little stock and you won’t have enough to fulfil customers’ orders and production will slow or cease. You also won’t be taking advantage of discounts available to businesses able to buy in bulk. Or products or goods to be sold or redistributed to other people and companies. There are many stock control systems available, including accounts software packages. Your choice of system depends on how many different products you need to track and how many you have to store. A small office’s stationery stock doesn’t need an elaborate system – here you could use a spreadsheet to track stock levels. However, a company importing and distributing goods around the country, will need to use Purchase Order Processing (POP), Sales Order Processing (SOP), as well as a system to track and reorder stock. You’ll also need a stock room or warehouse, to hold stock. Good organisation means that finding stock items and packing goods will be easy, efficient and fast. You may need racking or shelving for clearly labelled and coded stock. If goods are perishable, or have a limited shelf life, it’s important to rotate stock, so older items are picked first. Your most popular lines should be easily accessible, to save time. Regular stock counts ensure that figures agree with those on your accounting package. A well-organised stock room or warehouse will also make it easier and quicker to carry out an accurate stock count. If your stock count does not agree with your accounting figures then work out why. Your warehouse or stock room should be tightly managed and lockable. Everything that goes in and out needs to be signed for and a paper trail needs to go back to the accounts department, for staff members to update records. Invoice is raised for sending to the customer. Larger companies often use bar codes or microchips within their product packaging. This makes counting stocks in and out simple and almost entirely automated. And what stocks you already have on order from suppliers. If you use an accounting package to help control your stocks you’ll be able to print out reports that tell you how many of each stock item, or product, has been used or sold, over a given period of time. You‘ll also see which items have not moved. How often you should be re-ordering. You’ll also need to understand your lead-time from suppliers on materials and goods, and also ensure that you system flags up any additional and relevant information. When sourcing an accounting package to handle your stock control, think about whether you have multiple warehouses. Do you have different prices? And do you trade using foreign currencies? If you are buying materials or goods in bulk, some suppliers allow you to hold your stock at their warehouses, for a fee, and then call them off as required. Others also pick and pack goods for you, and send them direct to your customers. Here you are relying on your suppliers to give good service to your customers, and you lose some control. Always try to have more than one supplier, so that your business success is not dependent upon your current supply chain. Also don’t rush into coding up your stock items, as this needs some serious consideration. Within your accounting software it’s wise to record as much information about each stock item as possible. The more information you include, the more detailed and tailored the reports you can produce. If you’d like help in organising your warehouse or stock room, coding goods, or setting up details on your accounting package, then please get in touch. WHAT IS GOOD STOCK CONTROL? Every business has some stock or inventory to control. Whether that is materials used by a carpenter, car parts for a motor garage, paper, ink cartridges and business cards for a small office, goods/materials used in production or products/goods to be sold or redistributed to other people and companies. So it is imperative that you understand the principals of good stock control. Efficient stock control means your business will have the right amount of stocks, in the right place, at the right time. If you hold too much stock, or order too soon, then you are tying up cash and you may be incurring storage costs. Depending on what stocks you are holding, they may be deteriorating and they may also be subject to theft, damage and obsolescence. This error often occurs when the level of demand for your products has been overestimated. If you hold too little stock then you won’t have enough to fulfil your customers’ orders and production will slow or cease. You cannot take advantage of buying in bulk either. There are so many stock control systems available, normally as part of an accounts software package. Your choice of which one will depend on how many different products you need to track and how many of each of those products you have to store. Obviously, a small office’s stationery stock doesn’t need an elaborate system. Here you could use index cards or spreadsheets to track the stock movement and levels. However, a company importing goods and then distributing them around the country, will need to use purchase order processing (POP), sales order processing (SOP), stock re-ordering levels, current stock levels, etc. You will also need a stock room or warehouse, to hold the stocks. 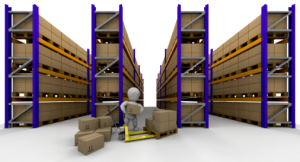 Again, depending on how much stock you have to control, you need to organise the stock room or warehouse so that finding the individual stock item or picking and packing goods, is easy and fast. You may need racking or shelving with clearly labelled stock items by code. If goods are perishable or have a shelf life then make sure you are rotating your stocks i.e. newer items to the back so older items are picked first. Make sure that the items that sell the most, or you use the most of, are easily accessible, to save time. You should do regular stock counts to see if your stock levels agree with your accounting packages figures and adjust where necessary. Having an organised, stock room or warehouse can really speed up your ability to carry out an efficient, accurate stock count. If your stock count does not agree with your accounting figures then work out why not – you may have shipped out too many, or not enough, of an item to a customer or items could have gotten damaged or stolen. It could be that you have counted wrong during your stock count so it is worth counting those particular items again. Your warehouse or stock room should be tightly managed and preferably lockable with everything that goes in and out being signed off and a paper trail that gets back to the accounts department, to update the stock. 2) Sales order raised on the accounting software in SOP. 3) If enough stock, customer order can be fulfilled from warehouse. 4) If not – Purchase order raised to supplier in POP. 5) Goods arrive at your warehouse with delivery note. Goods are counted and checked into the stock area and put in their appropriate place. 6) Delivery note goes to accounts department to receipt in on POP. Therefore increasing stock levels. 7) Stock is allocated to the customer order in SOP. This stops the stock being used by another order. 8) Customer delivery note and picking and packing notes are printed and go down to warehouse for order to be fulfilled. 9) Warehouse staff picks and packs the order and signs off the picking and packing notes. 10) Goods are dispatched to customer. 11) Picking and packing notes back up to accounts to fulfil the order on the accounts software. Therefore decreasing the stock levels. 12) Invoice is raised to customer. Bigger companies with huge warehouses often use bar codes or micro-chips within their products packaging, to make counting stocks in and out very simple and almost entirely automated. Bars, cafes, restaurants and retail outlets can also use electronic point of sales or EPOS systems to take orders, manage stocks, give receipts and take payments with credit cards etc. You need to forecast your company’s re-ordering of stocks based on your current open sales orders, past customer ordering history and also what stocks you already have on order from suppliers. If you use an accounting package to help control your stocks you will be able to print out reports that will tell you how many of each stock item, or product, has been used or sold, over a given period of time. You will also be able to see which items have no movement. Using all this information you can work out, on average, how much of each stock item you should hold, at any given time. What are your minimum stock levels? You will also be able to calculate how often you should be re-ordering to top your stock levels up. Do you know what your lead time from your supplier is on materials and goods? When sourcing an accounting package to handle your stock control, think about whether you will have multiple warehouses. Will you have different prices for items? Will you use foreign currencies? If you are buying materials/goods in bulk, some suppliers allow you to hold your stocks at their warehouses, for a fee, and then call them off as you require them. Others will also pick and pack goods for you, and send them directly to your customers. Obviously here you are relying on your suppliers to give good service to your customers, and you will lose some control. Always try to have more than one supplier of your materials/goods so that you always have an alternative source should one dry up. Do not rush into coding up your stock items. This really needs some serious consideration. Within your accounting software it is wise to record as much info about each stock item as possible, with the supplier’s stock codes, product weights, measurements, type or category, supplier details, sales price and costs price, etc. The more information you have put in to start with, the more detailed and tailored reports you can produce. If you would like help in organising or setting up your warehouse or stock room then please get in touch. Maybe you need help with setting up your stock control and products on your accounting software or are not sure how to code your stock items. All our contact information is on our website. Or you can call 0808 123 1399 or email tina.parker@nozeyparkers.co.uk .